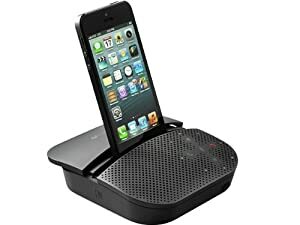 Looking for a speakerphone for your home office? If you want high quality for your conference calls, don’t just go out and buy any old speakerphone! A lot of them aren’t any better than the one built into your mobile phone. I’ve tested them and weeded out the duds so you don’t have to waste your money. Working in a home office comes with a lot of perks but there are some big cons as well. For conference calls, there’s just no way a home office setup can compete with enterprise-level phone systems, right? In this post, I’ll show you that you can indeed experience a high-quality call experience in your home office with a small external speaker. These are the 10 best speakerphones for the home office. With a 360-degree Omni-directional microphone, this solution means that your voice will be heard clearly no matter where you are in the room. This is great for home offices with a few different places to sit. 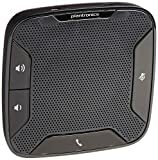 You can leave the speaker in one position and then use it while sitting at your desk or while sitting in a comfortable chair on the other side of the room or even when walking around. It’s also great for those times when you have more than one person in the room. This conference phone system is great for 1-4 people. This is a very compact and portable tool, so it’s easy to take with you when you travel as well. Getting it set up couldn’t be easier, with a simple plug and play set up via USB or Bluetooth. It’s certified for Microsoft Skype for Business (Lync) in plug-and-play mode. This model offers a Bluetooth 3.0 range of up to 100 meters on Class 1 devices. Alternatively, you can use the USB HID dongle. As far as design, this is an attractive tool. It’s round, with a lot of space for the large speaker grill. 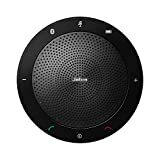 Around the outside of the speaker are capacitive buttons for power, volume control, mute, Bluetooth pairing, and answering or declining a call. It’s worth pointing out that the glossy button area is prone to fingerprints if that’s something bothers you. In between the speaker grill and the buttons are some LED lights that give you helpful visual cues. For example, it can show you the volume level or when the Bluetooth connection is complete. 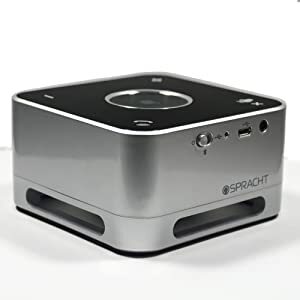 Although this is a great conferencing speaker that will ultimately give you a much more clear connection than a standard phone speaker would, there is also a 3.5mm jack available. This gives you the option of using headphones to make the call experience a bit more private. There is an included USB cable for charging the speaker. You can expect to get 15 hours of talk time from a single charge. The Jabra Speak 510 has a lot of great reviews for a reason. It’s great at what it does which is provide crystal clear audio quality on both ends of a call. Let’s face it: the speaker option on an iPhone has its advantages but the call quality really suffers. When you want to have a professional conversation with excellent call quality on speaker, you really need a better solution. This tool from Logitech takes your iPhone, android phone or tablet and gives you the quality you’re looking for. You simply place your phone or tablet on the speaker which doubles as a stand and then pair the speaker and the mobile device using either Bluetooth or NFC. . There is also a USB connection option, which is great for connecting a Mac or PC computer. 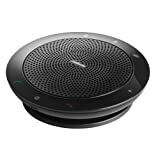 This speaker is optimized for Microsoft Lync, Cisco compatible, and Skype certified. In addition to audio calls, this is an ideal tool for video calls. The stand holds your phone or tablet at an optimal angle. You’ll get shake-free video and impeccable audio during a hands-free video call. This stand can even be used when you’re not on a call. You’ll be able to glance at the screen to see incoming messages and alerts easily. There are simple buttons for volume, mute, call answer and call end. There are also LED lights that flash when a call is coming in. 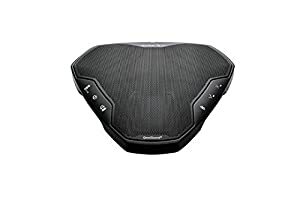 This speaker is compact and portable and it comes with a nice zippered neoprene carrying case. You can expect to get around 15 hours of talk time on a single charge. 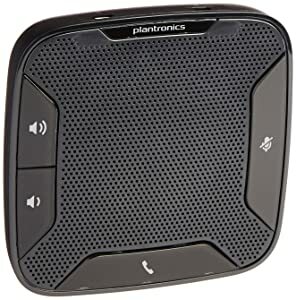 This is an ideal speaker phone for using with a mobile device like the iPhone and it’s great for both audio and video calls. For video calls, this device helps you take the experience to the next level. In addition to offering great audio quality, this tool will provide excellent video quality as well. It has full HD 1080p video with autofocus and digital pan/tilt/zoom. It offers a 90-degree field of view and 360-degree sound. The sound is excellent because of the noise cancellation ability and full duplex Omni-directional mics. Wireless screen-mirror projection lets you display the video call or presentations or other media from a laptop or mobile device to a large screen. The wireless screen mirroring is only compatible with Android and Windows. Other features, though, will work equally well with PC and Mac. 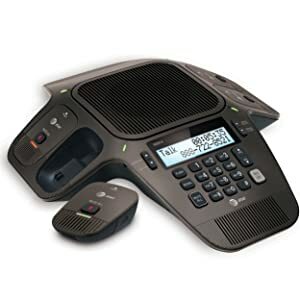 This device is optimized for Microsoft Lync 2013, is Cisco Jabber and WebEx compatible, and is Skype certified. It’s also compatible with most other business-grade UC platforms. The rechargeable battery gives you up to 3 hours battery life for video conferencing, or up to 15 hours for Bluetooth audio calls. 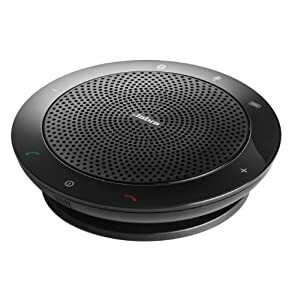 This tool is probably more than most home offices need but if you want a speakerphone that is great for video conferencing, this is one of the best options. It’s also great for those times when you have more than one person in the room. This phone speaker is great for 1-4 people. This is also compatible with a Kensington-style lock feature for added security, but that is only really needed in a bigger shared office environment. For the home office, you shouldn’t really need that. The speaker is compact and portable and it comes with a nice zippered pouch. It’s easy to throw in a briefcase or laptop bag and take it with you on the go. For the PC user, Plantronics Calisto 610 is a relatively affordable and simple tool that gets the job done with excellent audio quality. If you have a modern aesthetic, you’ll probably appreciate the design of this conference phone system. It is round, with a unique brushed finish on top reminiscent of a record. There are some simple buttons near the center of the device. Around the edge of the unit are multi-colored LEDs that light up to provide visual cues. When muted, for example, it will light up solid red. If you touch the power button, you’ll get an indication of how much battery power is left by how much of the outer ring lights up green. There are 7 microphones integrated into the unit, one in the center, and six spread throughout the outer edge. 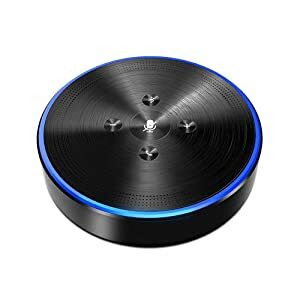 This 360-degree control makes it easy to have multiple speakers in the room and lets you move around without worry about your voice no longer being picked up. A pretty cool feature when you have multiple speakers in the room is that a light will indicate which microphone is picking up. The quality of the speaker itself is very good, with no feedback or echo. It is great for calls but this is a speaker that will also be more than adequate for streaming music or other media. This speaker will work with both PC and Mac as well as both iOS and Android devices. It can connect via Bluetooth as well as USB. It is optimized for a number of UC platforms, including Skype, Google Hangout, Microsoft Lync, Cisco, Avaya, and FaceTime. The Office Core M1 has a built-in 5200mAh rechargeable battery, allowing you to use it as a power bank. It supports up to 12 hours playtime, 20 hours music playback and 1 month standby time. This lets you charge your cell phone or other devices, even while on a call. The Office Core M1 stands out for offering superb audio quality, having a unique and attractive design, and for including a battery that can serve as a power bank. This speaker is essentially the exact same tool as the Jabra Speak 510 but optimized specifically for and certified by Microsoft. It is compatible with Windows Microsoft Lync and Microsoft Office Communicator. It also works really well with Skype for Business. Although you can definitely use this with Mac and iOS devices, it’s probably best suited for PC and Android devices. It is an easy plug-and-play tool with USB or a fast pairing with Bluetooth. The quality you get with USB tends to be a bit better than Bluetooth, although the Bluetooth connection is also quite good. Sound quality is very high with this and you can use it to play music or other media as well. In this case, the USB connection is your best bet. With Bluetooth, your music streaming quality will be a bit lower. The microphone is good, with 360-degree pickup so you have the flexibility to move around the room a bit, as desired. 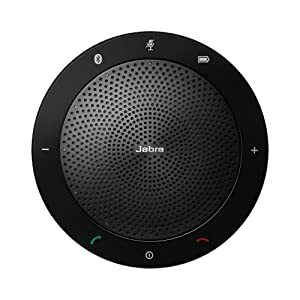 This Jabra call speaker is almost the exact same thing as the Jabra Speak 510 which is to say that it is excellent. The only difference and the potential advantage is that it is the best one for Microsoft tools, in particular. To get the quality you need in a loudspeaker for professional use, you generally have to spend quite a bit. This speaker from Konftel isn’t cheap but it does come in at a lower price point than most of the tools on this list. Despite the relatively low price, this unit offers a good level of quality. It offers OmniSound with HD audio. The sound quality is good enough that you can successfully stream music in HD quality. You can connect via Bluetooth, NFC, or USB. It will work with both PC and Mac as well as both Android and iOS devices. The operation of this unit is pretty simple. There is an LCD screen on the base and some simple buttons along the side. There is a jack that allows you to use this with a headset if desired. This unit is compact and portable. It’s easy enough to throw it in a briefcase when traveling. It does not come with a case of any kind, however. If you want a low-cost alternative to a headset for those work calls in your home office, the Konftel Personal Bluetooth Conferencing Unit is a good option. In terms of design, this is probably the least attractive looking device on this list. The design just looks a bit dated. It is quite small and does come with a nice case. Plug-and-play with USB is the only connection option with this device. Bluetooth is not an option. The reason this somewhat outdated device is still worth looking at is that it really does offer good sound quality. The omnidirectional microphone provides 360-degree room coverage. There is a noise-canceling feature that filters out background noise. The sound on your end is very good as well, with Powerful Digital Signal Processing that enhances the audio quality. There is a full-range driver with wideband support. There is a headphone jack on this unit, for those times you want a bit more privacy for the call. The Calisto P420 offers great quality and simple operation but has a dated design and only works with USB connection. This is another budget model that is still very much worth considering. The speaker offers high-fidelity audio. There is a passive bass radiator with a downward-facing speaker that helps give a satisfying depth and richness to the sound. Digital Signal Processing provides good noise cancellation. For voice calls, the volume tends to be on the low side. For music, the volume is generally better. You can pair your devices with USB, Bluetooth, or NFC. It is compatible with most UC platforms, including Skype and Skype for Business (Lync). For privacy, there is a headphone jack. The connection is fast and easy and operation is pretty simple. The battery life on this unit isn’t quite as strong as you’ll see with most of the speakers on this list. You can expect to get about 7 hours on a full charge. The design of this unit is a bit different than the standard look for speakerphones. It is square-shaped and has a lot more height than most. The is in part to accommodate that bottom-facing speaker. It has a clean and modern look, overall. There are some simple buttons on the top face. The Conference Mate Combo isn’t the best loudspeaker out there but it is a very good budget option with a unique design that contributes to a depth and richness to sound quality. If anyone knows something about telecommunication, it's a brand like AT&T. This unique loudspeaker phone option has six microphones, two fixed to the unit and four wireless. This lets you move around the room and set up however you'd like without losing quality. The sound quality is one of the best out there, thanks to full-duplex technology, digital mixing, and audio equalization. Ambient noise is effectively eliminated, as is cell phone interference. For each of the wireless microphones, you get 8 hours of talk time and 70 hours of standby time on a single charge. When not in use, the wireless microphones are stored on the base which also serves as a charging bay. In other words, you'll probably never run into a situation where you run out of power on a microphone during a call. Each wireless mic has a mute button. This is a landline phone that lets you save up to 50 names and numbers in a digital phonebook. Optionally, you can save 10 of these numbers as speed dial entries. You have your choice of 10 Ring Tones/Melodies and you can adjust the ring volume level as well. The design is simple and nice-looking. There is a large speaker in the center and four smaller arms jutting off from it. One features the keypad and a small backlit screen that displays the number, call duration, date, and time. Two of the arms are used for docking the wireless mics. The two fixed microphones are found at the bottom of the other two arms. If you’re looking for an analog phone system with conferencing capabilities, you won’t do much better than the AT&T SB3014. In addition to offer excellent audio quality, you have added flexibility with the wireless microphones. Which Conference phone you recommend for my Android phone? With the exception of the Plantronics P420, every unit on this list will be compatible with an Android phone. The Jabra Speak 510 is generally my top recommendation overall and it does work well with Android devices. The Office Core M1 is another great option, especially because you can also use it to charge your Android device. If you like to do a lot of video calls on your phone, the Logitech P710E is a nice option because the stand holds your phone in an ideal position so you can enjoy shake-free and hands-free video in addition to very good audio. Can I also plug in a Headset if needed? This is not an option on all of these devices but it definitely is an option for some of them. Some options that do have a 3.5MM jack for plugging in headphones or a headset are the Jabra Speak 510, the Logitech P710E, the Calisto P420, and the Konftel Personal Bluetooth Conferencing Unit. I am Hearing Impaired, which conference phone is the best for me? If you are hearing impaired, I'd generally recommend one of the devices that have a 3.5MM headphone jack. With headphones, you have a better chance of hearing well. Using headphones with a speaker ensures that you can hear well and those on the other end of the call can hear you well. If you'd rather not use headphones, I'd recommend staying away from the models that are known for tending towards low volumes like the Conference Mate Combo, the Konftel Personal Bluetooth Conferencing Unit, and the Office Core M1. The rest all offer a good volume level with the option to crank the sound up to a pretty high level. Working from a home office tends to mean a lot of calls. When you have a nice loudspeaker, you're able to have the same high-quality audio you'd get with an enterprise-level phone system. A lot of speakerphones you can buy aren't any better than the one built into a cell phone. In contrast, all of the loudspeakers on this list offer professional-quality that can transform your conference calls while letting you remain hands-free. Have you tried any of these for your home office setup? Let me know in the comments. Feel free to ask any questions as well. Is there a great speakerphone that I'm missing in this top 10 best list? Let me know! Hi Derek, If you only need better sound from your computer you could simply get a decent pair of USB 2.1 speakers, Like the Audioengine A2+ (I have them they are excellent), you would still need to buy an external microphone. Otherwise, you could also look into headsets with microphones.